Controls home automation functions, garage doors, alarm panels, etc., from up to 500ft (150m). * Similar to SK-910RBQ & SK-910RB2Q except with 3 outputs, independently programmable. Compatible with both fixed code and code-hopping transmitters. (See manual for details) Mode switch for easy programming. 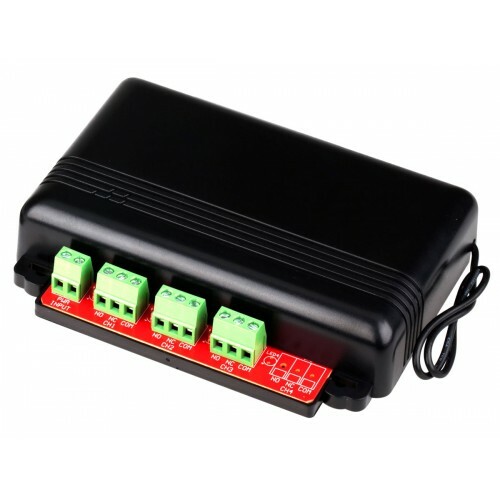 3 LEDs, one per channel, indicate RF reception, learn mode, transmitter cleared, output type. Add optional plug-in extended range antenna: SK-91ERSD. Note: If the timed momentary output is chosen for any channel, there will be only one time available for all channels. In other words, if a one-second output time is selected for one channel, then all other timed momentary outputs will be one second.